This example shows how to set port forwarding rules for ICQ but can be adapted for any other application. From the "Services" Tab select "NAT"
From the NAT options drop down list select "NAT rule entry"
Click the "Add" button and a new window will open. Rule ID = Enter a different Rule No for each rule. (You can enter a specific protocol such as TCP or UDP if required). 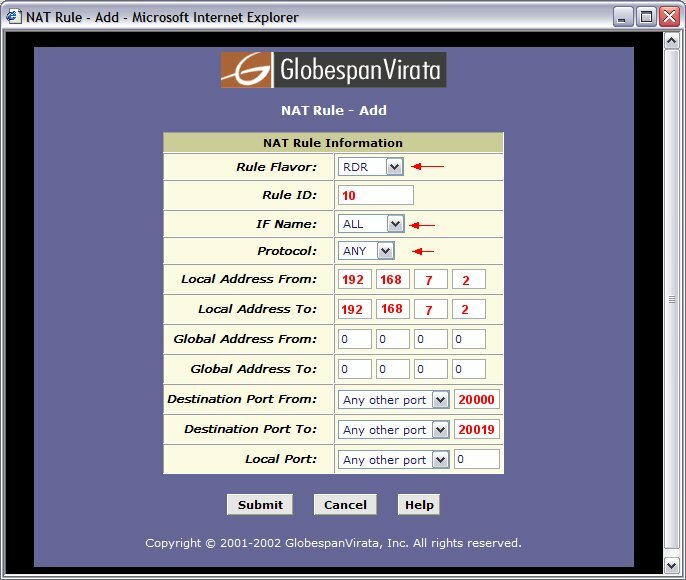 Local Address From = Enter the LAN IP no which the packets are to be forwarded to. Local Address To = Enter the LAN IP no which the packets are to be forwarded to. (used to specify a range of IP addresses). Destination Port From = Any other port = specify the port number or 1st port no in a range. Destination Port To = Any other port = specify the port number ot last port in a range. Commit changes in the admin tab. You may also need to reboot your router for some rules to work properly.